see Malarkey on the Potomac by Andrew Bacevich. 2. Christians are leaving that area and won’t be going back. 3. The United States government caused this catastophe. This entry was posted in War and Peace on November 26, 2014 by Doug Fuda. Don’t miss this one by Mother Jones: The Making of the Warrior Cop. And the militarization of America continues in the name of the national $ecurity $tate. Business is booming. This entry was posted in Home to Roost / Police State, Militarism and Christianity, Military Culture (of Death) on November 15, 2014 by Cammy. This entry was posted in CAM jukebox on November 15, 2014 by Cammy. As a soldier in the Roman Empire, Martin was riding his horse in military exercises one cold winter day when he passed a shivering beggar. His conscience was stung, so he stopped to tend to the man. 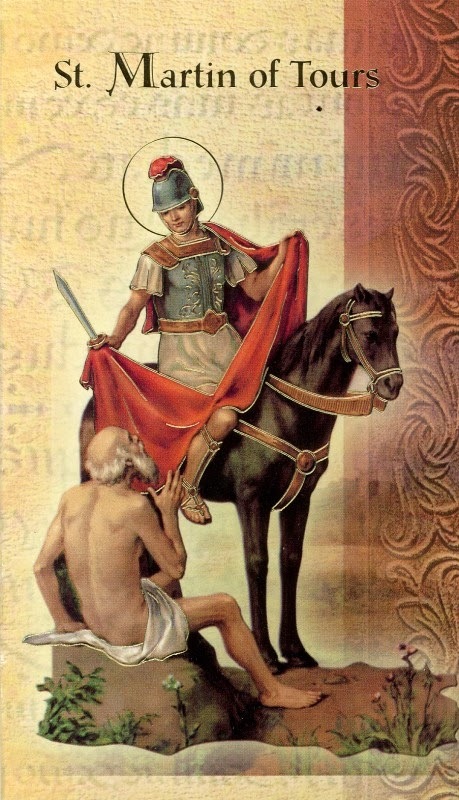 He dismounted the horse, took off his heavy military cape (called in Latin a cappa) and used his sword to cut a blanket-sized half to cover the man. That same night, he saw the beggar in a dream. Warmed by the cape he had been given, the beggar looked at Martin and, with the face and voice of Jesus Christ, thanked him. After this rite of initiation into discipleship, Martin knew that all his weapons and all his armor must be turned over to Christ. He immediately sought baptism and discharge from the Roman army. In explaining his stance as a conscientious objector, Martin spoke the same words used by a soldier-martyr forty years earlier, Marcellus of Tangiers. Martin declared, “I am a soldier of Jesus Christ; it is not permissible for me to fight.” Once baptized, he was ordained a priest, then a bishop, and was revered for his holiness throughout his life. This entry was posted in Conscientious Objection, Militarism and Christianity, Saints and Soldiers on November 11, 2014 by Cammy.